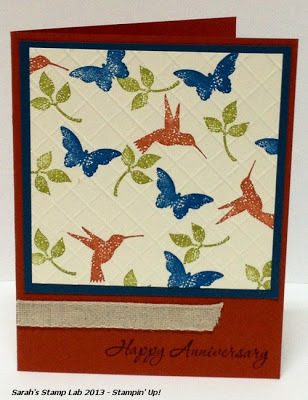 Today I am featuring another card that uses the Bloomin' Marvelous stamp set. This set is one of your FREE Sale-A-Bration options with a $50 purchase (before tax and shipping). I also got to play with my diagonal scoring plate for my Simply Scored tool. It gives just the right amount of texture. Hint: I did my stamping first and then my scoring.